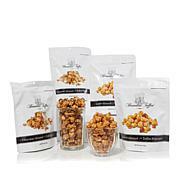 Satisfy your craving for crunchy, decadent toffee popcorn with these on-the-go-pouches. Munch your way through your afternoon meetings or snack on it while sipping your favorite coffee. They make great gifts, but keep some around for when your sweet tooth hits. Contains milk, almonds and cashews. Made in a facility that processes products containing wheat. Some of the best popcorn you will put in your mouth. My husband and I were fighting over the last bag!. This is truly incredible tasting product. I'm ordering again and again!!!!!!! I just love this popcorn. I buy it for gifts, as well as myself. I only wish that they sold it in a 6-pack. It goes so fast in my house. OMGoodness... this stuff is delicious! It taste soooo very good... The portion size is just not enough! You simply want more and you seriously can eat the entire back in one sitting. Your mouth will not get tired of chewing! this is really good ! I planed on using them for gifting, and so happy I ordered two sets. Of course I had to sample and am I glad I did. 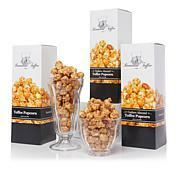 This is authentic, simple ingredients, yet the best Toffee Popcorn I have ever eaten. Don't just think about this, go ahead and order, you won't be sorry!! 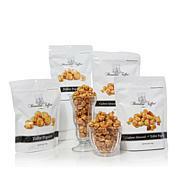 Good, Good, Good, toffee popcorn, will purchase again soon. Thanks again for your business.